Also serving communities of Bowdon, Bremen. The average cost of assisted living in Carrollton is $2,872 per month. This is lower than the national median of $3,346. To help you with your search, browse the 31 reviews below for assisted living facilities in Carrollton. On average, consumers rate assisted living in Carrollton 4.5 out of 5 stars. Better rated regions include Villa Rica with an average rating of 4.8 out of 5 stars. Review of The Hudson House, LLC. The city of Carrollton is located about an hour west of Atlanta near the Alabama state line. One of the best cities of which to retire in Georgia, Carrollton has five assisted living facilities within the city limits and 23 nearby for seniors who require help with daily living tasks, including grooming, housekeeping and medication administration. These facilities in Carrollton are regulated by the Georgia Department of Community Health. The Carrollton area is home to world-class medical facilities, including the Tanner Medical Center, in the event of medical emergencies or illness. Carrollton has an array of community resources for seniors, including the Carroll County Senior Services, an organization that arranges group trips and activities for seniors in the area as well as one senior center. The Carroll County Transit System provides rides at discount fares for seniors in Carrollton who need a ride to medical appointments and various errands. This door-to-door service should be scheduled at least 24 hours in advance and is available on a first-come-first-served basis. Each van will seat up to 10 people and is equipped with wheelchair lifts. The cost of living index in Carrollton is 98.8, which is slightly lower than the national and state average of 100. Seniors who live in Carrollton may be able to hold onto more of their money when purchasing groceries and other necessities. Like most cities in Georgia, Carrollton experiences hot and humid summers with highs around 88 degrees Fahrenheit and short and cold winters with lows around 30 degrees Fahrenheit. The area only gets around an inch of snow a year and approximately 52 inches or rain. Golf and other leisure sports are played outdoors year-round, which is ideal for active seniors. Crime is significantly higher in Carrollton than the national average, which is a safety concern for seniors in the area. When ranked on a scale from one (low) to 100 (high), property crime is ranked 64.6, which is high in comparison to the national average of 38.1 and violent crime is ranked 57.8 in comparison to the national average of 31.1. Assisted Living costs in Carrollton start around $2,872 per month on average, while the nationwide average cost of assisted living is $4,000 per month, according to the latest figures from Genworth’s Cost of Care Survey. Carrollton and the state of Georgia have two different waivers through the Medicaid State Plan to help seniors who need help paying for an assisted living facility. The Community Care Services Program (CCSP) is available to Medicaid eligible seniors who are 60 and older and require nursing care. 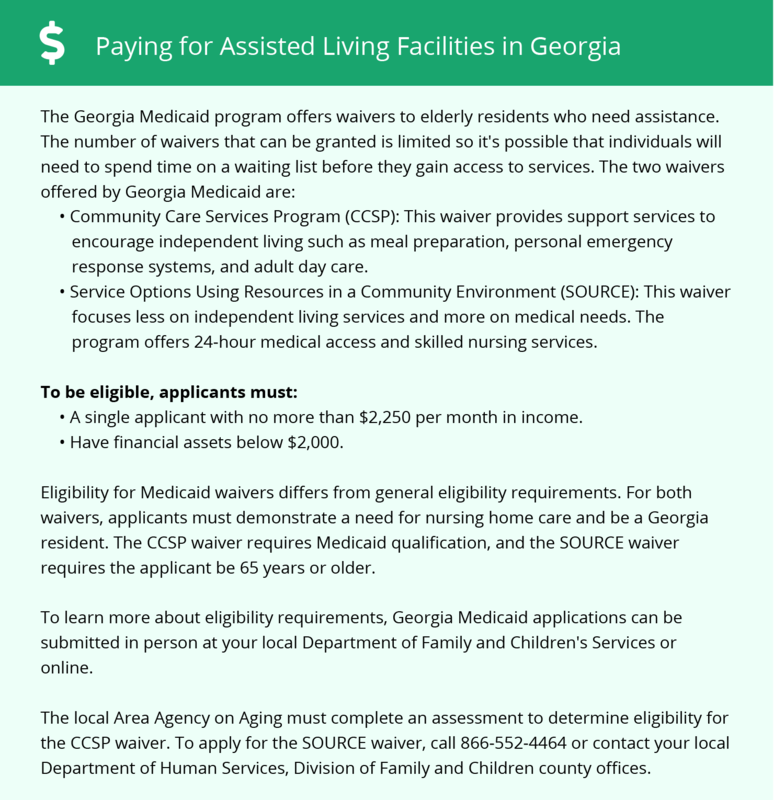 The Georgia SOURCE waiver is available for individuals 65 and older or individuals with disabilities who are under the age of 65 and require nursing-home level care. To see a list of free assisted living resources in Carrollton, please visit our Assisted Living in Georgia page. Carrollton-area assisted living communities must adhere to the comprehensive set of state laws and regulations that all assisted living communities in Georgia are required to follow. Visit our Assisted Living in Georgia page for more information about these laws.